We manually annotated the 1,252 verified handles, for various characteristics of the handles, like party affiliation, state / city, and gender. Among the 1,252 handles, we found 865 (69.1%) to be men, 133 (10.6%) to be women, and the rest 254 (20.3%) handles to be associated with parties. This blog is dedicated to analysing men and women handles. Analysis was done with the data as of March 1, 2019. We found female political handles to have more followers than males. On average, females had 368.5K (min: 422, max: 12.2M) followers, while male handles has 347.8K (min: 47, max: 46.2M) followers. With @narendramodi having the maximum followers (46.2M) in male and @SushmaSwaraj (12.2M) in female. Below is the table with top 5 handles, male and female, with their followers count. In men, the handle which has the least (47) amount of followers is @VPROfficial and the female handle @shardarathore1 has 422. When we look at handles that these political handles are following, we can see that females follow lesser number of people compared to males. On average, we find men have 444.87 followings (min: 0 & max: 57,290) while it was 394.90 (min: 0 & max: 2,540) for females. Among men account, @Dr_Uditraj has the maximum number of followings with 57.3K, while @rajeambrishrao has 0 following. Among women, @szarita has 2,540 following, and @SushmaSwaraj has 0 following. Below is the table with top 5 handles in male and female with their followings count. When we look at the content generated by men and women, on average we find women generate more content than men. On average, women generated 9,834.32 tweets (min: 0 @priyankagandhi, max: 142.7K @khushsundar), while men generated 7,432.21 tweets (min: 7 @RanjitKangujam, max: 142.8K @amitmalviya). Below is the list of Top 5 accounts with highest number of tweets with the tweet count. On further analysing the activity of these verified handles, we also find that on a daily average, Female handles tend to post more than the Male handles. On average, the average tweets posted per day by a male account is 3.50 (min: 0.06, max: 43.56) and for a female account is 4.30 (min: 0.03, max: 45.67). This was found out by averaging out all the tweets posted by each handle over the time they were active (Last tweet posted – Date of creation) on the social media platform. 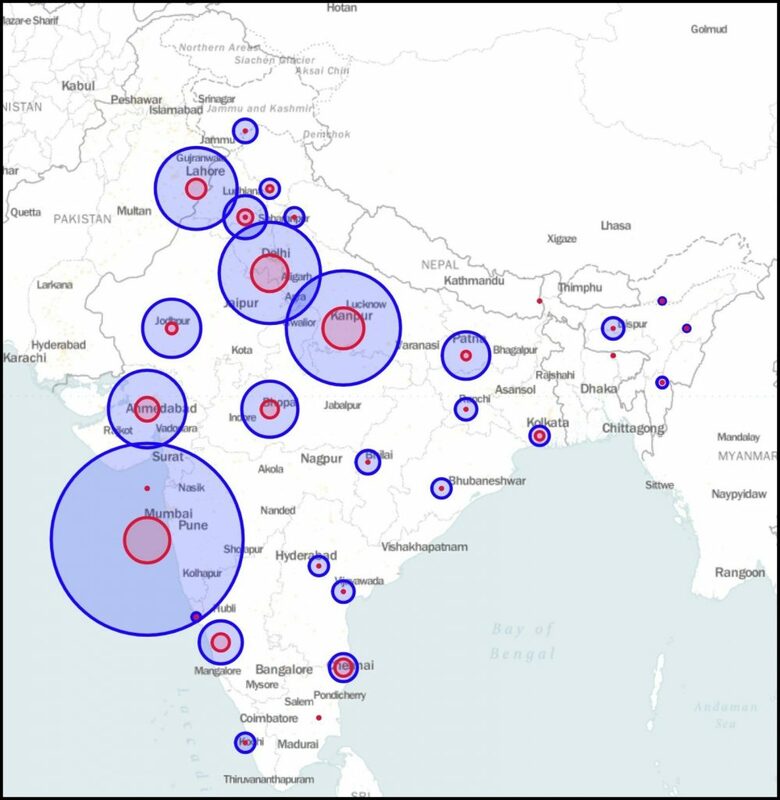 Below is the map depicting gender-wise, state-wise distribution of handles across the country. Gender distribution of male (blue) and female (red) accounts across states. 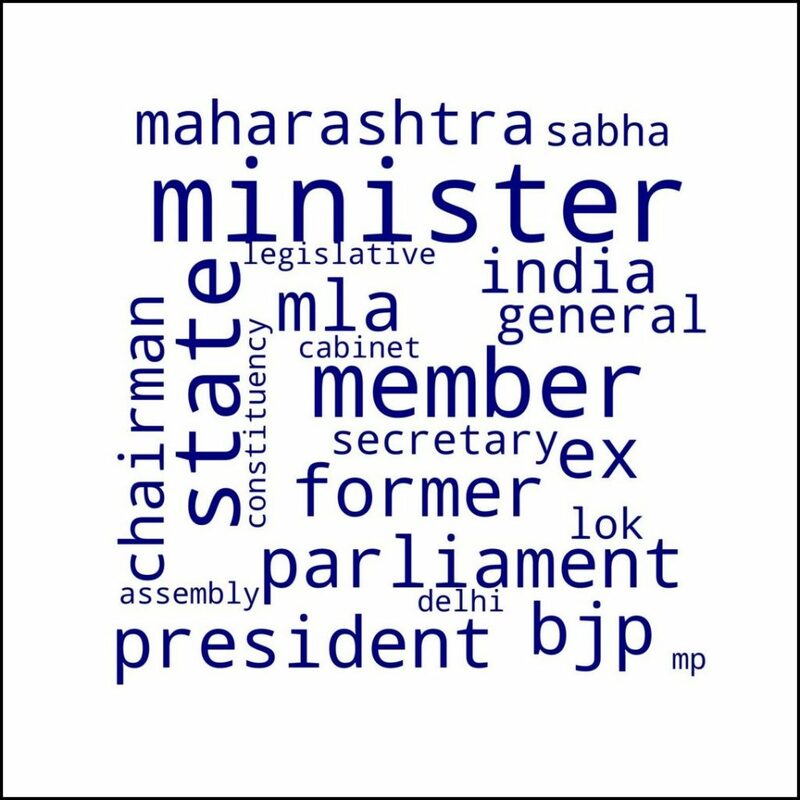 Word cloud of bio description of male political handles. 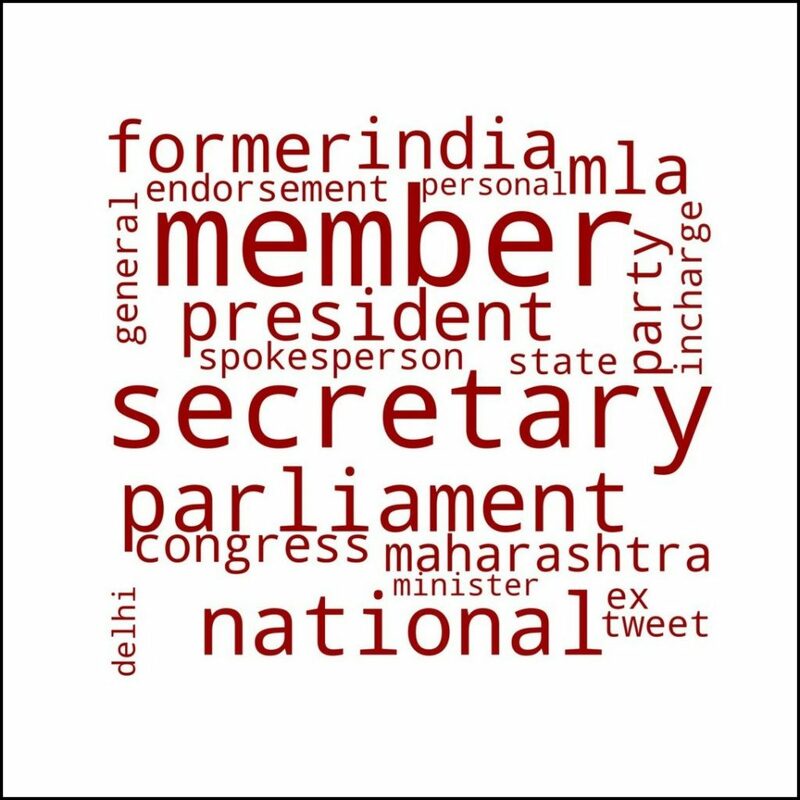 Word cloud of bio description of female political handles. Analyzing the creation date of the accounts, we found that at least one Male account was created in every single month starting 2010 until now, while there were many months when female accounts were not created. Below is the graph depicting the same. Per user analysis & Per tweet analysis. To understand the way the information is propagating in the network, we analysed the re-tweet information for all the tweets. To understand the following & follower analysis of the handles, we drew the network graph of the interactions. Here is the graph of only males and females together. You can find the follower / following graph of males here and females here. 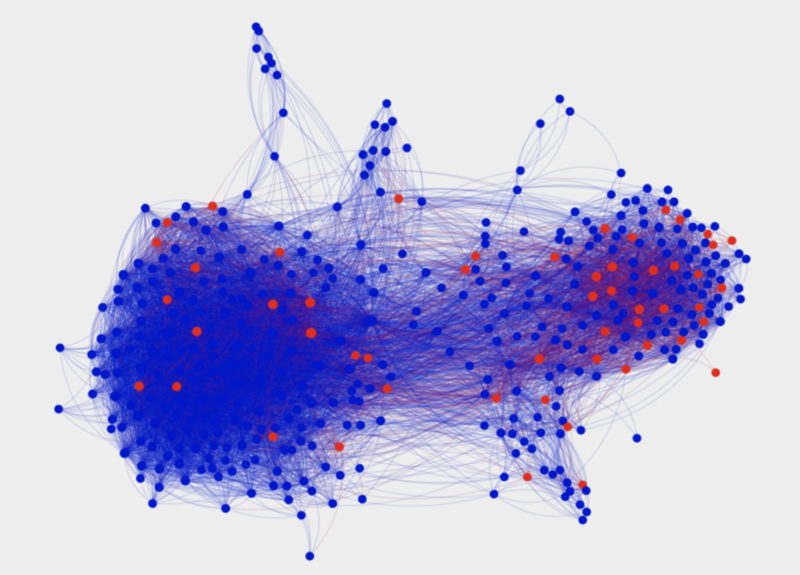 Follower / Following network between verified male (blue) and female (red) accounts. *Due to rate limits, we cannot collect all tweets by all users, twitter allows us to collect last 3200 tweets of user handles. We collected tweets for all the 998 handles (both males and females). Total number of accounts which had more than 3200 tweets were 457, of which 464 Males, 83 Females. In total we collected 2,447,233 tweets posted by males and females.